One of the early Macintosh computers in the classic all-in-one style was the Macintosh Plus. The illustrations were made with CADintosh X and Affinity Designer. Khan Academy provides free lessons on math, arts and sciences and includes content from partnered institutions. A helpful way of organizing photos, in addition to your image catalogue, is to keep a photography journal. I find that it helps for identifying photo events: time and location. This can help for locating pictures elsewhere on the computer and any photographic details that may not be in the image data. There are various ways of doing this. On a computer general journalling software is available that can be used as a place to enter a photo, comments and information. Another way for those that want a consistent manner of entering information is configure a database program to keep track of the details. The method I use is entering in a database program called Tap Forms, available for the Mac and iOS. In Tap Forms I have a form that provides a space for an image, date and a text entry field for comments. Syncing between devices means you can have the information wherever you are. GraphicConverter provides a great selection of features including browsing and image editing. For those occasions where you need to use another image editor it is easy to send the picture from the browser to open in your desired program. There are two different ways to do this. Right click and in the menu select “Open With”. Add the “Open With” button in the toolbar. The external editors need to be set up initially to make them available. The editors are set in the preferences. In the window add any photo editors you have available here using the + button. More than one program can be listed here. In the browser right click on the image, select “Open With” and the list of applications will be shown. It can also be accessed from the main menu Edit -> Edit With. For the option “Open With” Application set your preferred program. Right click on the toolbar to customize it and add the “Open With” button to the toolbar. 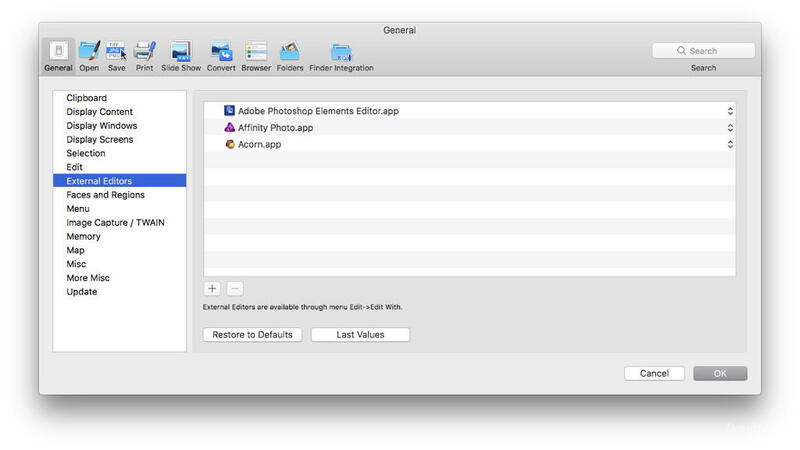 Affinity Photo is the program chosen here, which means that clicking on the “Open With” button on the toolbar will open a selected image in Affinity Photo. The setting here will also affect when opening from the menu by placing the chosen program at the top of the list. Today the Internet Archive, an important resource documenting the world wide web, is celebrating its 20th anniversary. A key feature has been the scanning and archiving of websites over the years. Using the WayBackMachine you can type in a URL and see what the website looked like in the past. The Internet Archive also provides access to a large number of contributed text and multimedia resources. Below are a couple links to some Apple related resources. The rain is coming down and the leaves on the trees are changing colours. With an individual picture the camera model is shown in Photos if you right click on a picture and select Get Info. There may be times when you want to sort your photos by the camera you took them with. For instance if you want to separate out the pictures taken from an iPhone or iPad from pictures taken from a DSLR. Using Smart Albums it is possible to have Apple Photos display your photos based on the camera you took them with. If you have RAW images in the program then you can filter those out too. In Photos select File -> New Smart Album… This will bring up a dialog box to set the options for the album. Many websites still provide low contrast for text, even though it can make it difficult to read. 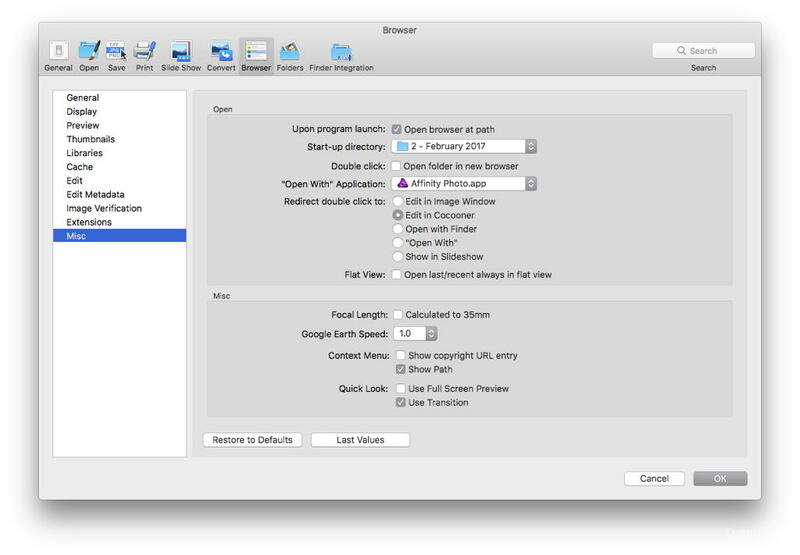 One solution in Safari is by creating a CSS file that the browser can use in addition to the designer’s and then specify in Safari’s preferences. Create a blank file. This is best done in a plain text editor, such as BBEdit or TextWrangler. If using another program make sure the file is saved in plain text. Type the following line in the file to provide black text on a white background. Save the file on your computer in plain text format with a name such as “override.css”. Within the “Advanced” pane of Safari’s preferences select the option “Style Sheet” and then “Other…” from the menu to locate your file. Choose “None Selected” to remove the changes at any time. Note the stylesheet won’t change all of the text, but should affect the main content. If you know some basic CSS you can adjust it to work best for you and use when needed. If you are a web designer, please consider your visitors and remember that there are factors beyond just making your website look nice. Even if high profile companies like Apple have this issue doesn’t mean it should be followed. Recently I changed the theme for this blog with the above in mind. A new theme also provided for a current and responsive theme suitable for mobile devices. Last summer a new advanced image editing program for the Mac was released called Affinity Photo. The program was the second graphics program released in the Affinity line after Affinity Designer, an illustration program. More programs for the Mac have been promised including Affinity Publisher, a page layout program. Affinity Photo uses various “personas” to group different types of functions for image editing, working with RAW images and stitching together panoramas. Image editing allows for many different kinds of non-destructive adjustments. Extensions to allow some of the tools to work in Apple Photos are also available. On March 15 an announcement was made indicating that Affinity software, including Affinity Photo, will come to Windows. Serif which is the company behind Affinity software previously made graphics software for the consumer market on Windows, but now is focusing on the Affinity software suite.